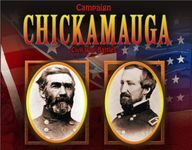 It was at Chickamauga that Confederate General Braxton Bragg launched his counteroffensive to retake the vital rail junction city of Chattanooga from Union General Rosecrans. And it was at Chickamauga that the Confederacy had one of its last chances to win the American Civil War. Among other things, it was here that General George Thomas won the nickname "Rock of Chickamauga" for this valiant stand.